Excellent capture almost looks photoshopped into frame ! Amazing image! Love the yellow light within the blue arch! Outstanding shot!!! I love the blues and I love how the schooner is framed between the icebergs. Incredible shot! 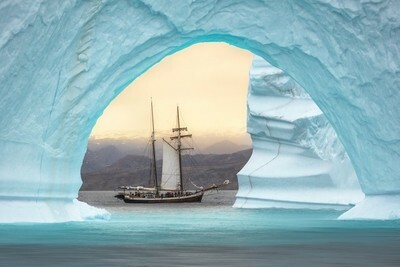 A traditional sailing schooner passes behind the arch of one of the most beautiful icebergs I've had the pleasure of witnessing in the arctic.